Locate the Access database file "email.mdb" in the \<Controls installation folder>\Live Demos\App_Data. In the Solution Explorer, copy the "email.mdb" file to the project's App_Data folder. Add the DataGrid, RadEditor and label controls to your page. You can paste the ASP markup shown below. The key portion of markup to notice in the example below is the tag EditItemTemplate that contains the RadEditor .You can bind text from the database to the editor by assigning the Content property with an Eval statement: Content='<%# Eval("Body") %>' Note that this is done as an attribute of the <telerik:RadEditor> tag and not within the <Content> child element. Also note that the Eval statement is surrounded in single quotes. <telerik:RadEditor RenderMode="Lightweight" ID="RadEditor1" runat="server" Content='<%# Eval("Body") %>' EditModes="Design"
Add the namespaces System.Data.OleDb and Telerik.Web.UI to your "uses" (C#) or "Imports" (VB) portion of the code-behind. // Populates the grid with all columns and rows of the "Email" table. 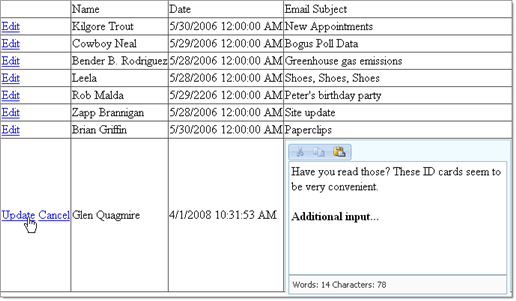 connection.ConnectionString = "Provider=Microsoft.Jet.OLEDB.4.0;Data Source=" + Request.MapPath("\App_Data\email.mdb") + ";User ID=;Password=;"
' Populates the grid with all columns and rows of the "Email" table. Const updateCommand As String = "UPDATE Email SET [Date] = Now(), [Body] = @content WHERE [ID] = @nid"